The quantitative reasoning section tests algebraic, geometric, and data analysis skills. In recent years, ETS has tried to focus more of this section on data analysis, particularly making inferences from charts and graphs. Scoring well on this section matters most to STEM students and some soft science majors (such as economics). There's no clear winner for quantitative reasoning; it's crowded near the top. Nonetheless, mathematics students and materials engineering students tied for first. For the quantitative section, a 153 is the 50th percentile score, and the scores follow a mostly normal distribution. The average score for math majors, for instance, was 162 — the 83rd percentile for all test takers. Finally, the analytical writing section requires two written responses in contrast to the multiple choice verbal and quantitative sections. One prompt in the analytical writing section requires test takers to dissect a logical argument while the other prompt asks students to take a stand on an open-ended issue. Once again, philosophy majors stepped out in front with a 4.4 average score on this section (the scores range from 0 to 6 in half-point increments). Political science and religion/theology majors came in second tied with an average score of 4.2. The 50th percentile on this section sits between a 3.5 and 4.0, but a 4.5 jumps up to 80th percentile. A full 42 percent of students score between a 3.5 and a 4.5, and the distribution looks like it's a little bit different than the other two sections, partly because the scale of possible scores is smaller. There's 13 possible scores on this section (0-6 in half-point increments) vs. 41 possible scores on the other two sections (130-170 ranges). 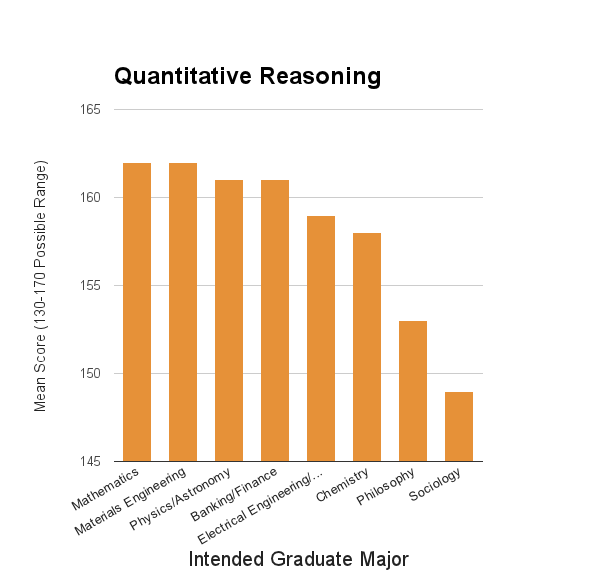 As mentioned earlier and in previous posts on our blog about GRE scores, these data represent intended graduate major, not necessarily undergraduate major. Nonetheless, there's often a strong correlation between undergraduate major and graduate area of study. In physics, for instance, 94 percent of domestic graduate students studied physics or astronomy as undergraduates (source, see table 3). This percentage, of course, likely differs for other majors, however, and some graduate majors are largely not taught at the undergraduate level. 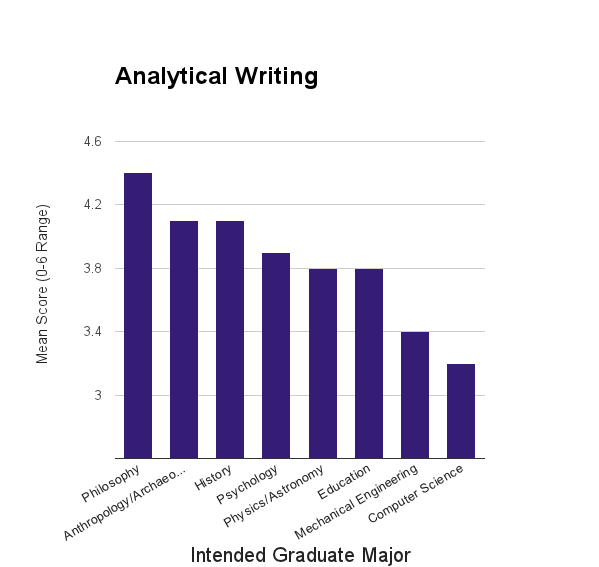 Notwithstanding, I suspect there's a pretty strong correlation between undergraduate and graduate major most of the time. Additionally, as we mentioned last year when we wrote about GRE scores, correlation does not mean causation. 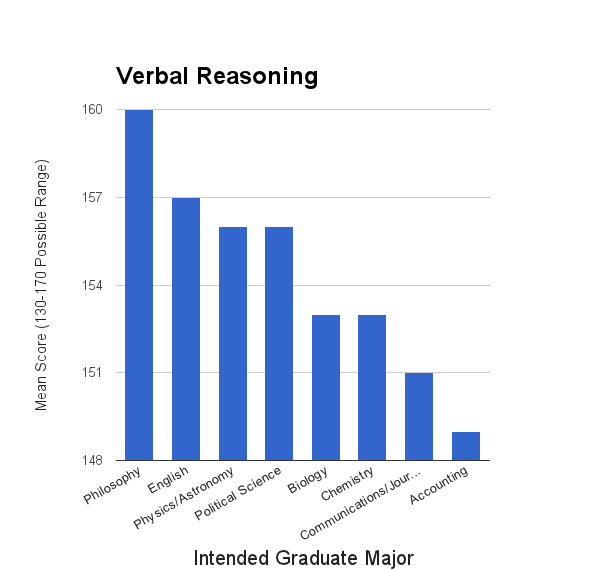 While philosophy classes' focus on logic and argumentation likely helped many of those intending to pursue graduate studies in philosophy, there's probably a selection bias as well. Many philosophy students may have already had a strong interest in logic and persuasive writing before enrolling in philosophy classes, for instance. Finally, different graduate school departments weigh the importance of the GRE differently. If a student knows that his admission does not depend heavily on GRE scores, he won't study as hard. Similarly, as commenter Anne noted in our post last year, some areas of study are much smaller and more selective. Consequently, advisers of undergraduate students may only encourage the very best students to pursue a graduate education, thus limiting the pool of test takers from some majors to only the best students from that major. But I do believe that one's undergraduate experience and course selection can have a significant impact on one's GRE scores. That's certainly not the only factor, however; studying for the test, natural ability, and stress tolerance all play a role in one's GRE success as well. To all GRE test-takers this fall, best of luck! Don't forget to brush up on those all-important vocab word lists.